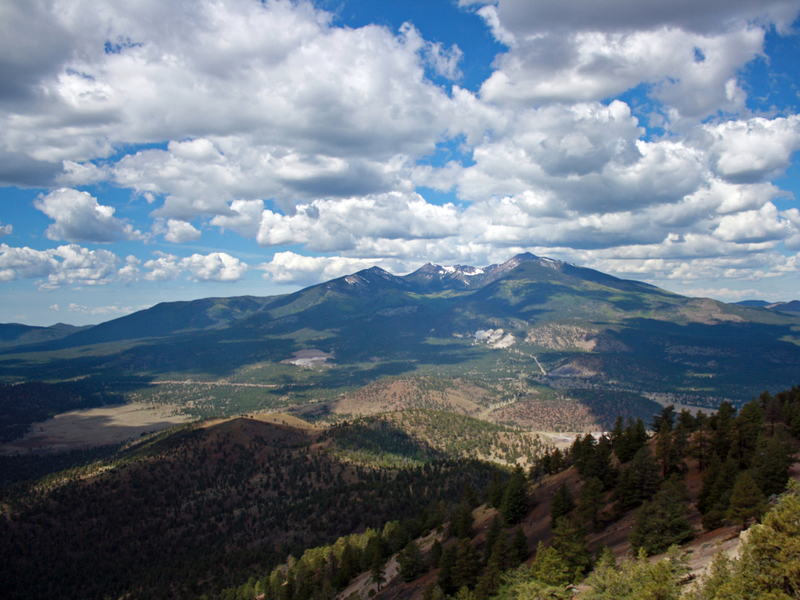 This challenging hike to the top of O'Leary Peak will reward you with great views of the San Francisco Peaks. Winter is generally too cold, but conditions can sometimes be okay for this west-facing hike. Beware of thunderstorms in Summer. 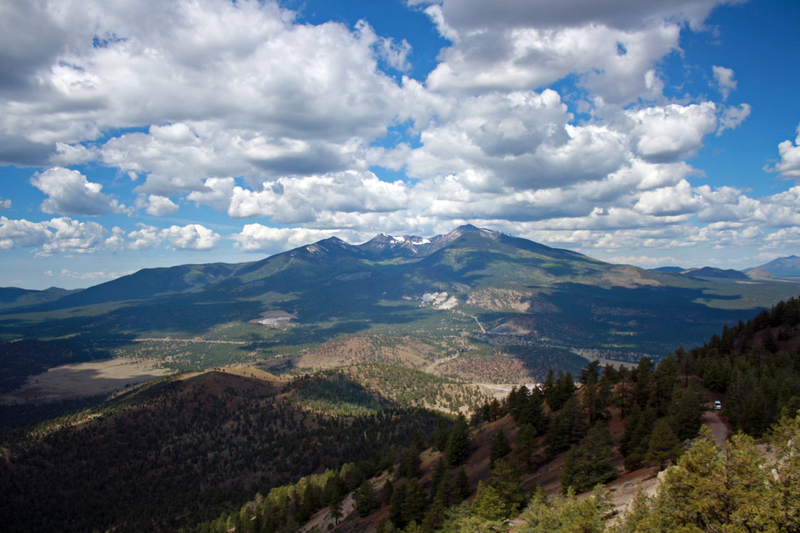 This hike summits the tallest peak in the Cinder Hills, northeast of Flagstaff. O’Leary is perfectly positioned between volcanoes clustered to the south and the vast Painted Desert stretching to the north. Climbing the wide switchbacks rewards with ever-expanding views of the volcanic moonscape below, including the conical Sunset Crater, which is the youngest volcano in Arizona, having last erupted only 1,000 years ago. The hike follows a Forest Service road that leads to an operating fire tower, but the real summit is one more jaunt uphill on a rocky trail. O’Leary may not look like much from afar, but the top of this mountain is one of the widest and most varied vistas in all of Northern Arizona, and the views along the hike are panoramic every step of the way. The trail, like the mountain, is rather unassuming at first, starting on a flat, cinder-graveled road among the pines. But look through the trees to and notice the wall of gnarly, black rocks. This is the lava flow from Sunset Crater that blasted out and solidified one millennium ago. You can leave the trail to scramble on the rocks for a better view. After about a mile of rolling terrain, the trail starts up the mountainside and begins to gain elevation very quickly. Trees become more sparse as you ascend this rocky slope, and the volcanic field’s true extent becomes apparent as it falls away below. The San Francisco Peaks and Inner Basin tower to the west. Endure the steepness and the heat for 3.5 more miles to the ridgeline atop O’Leary. From here, you can follow the road to the fire tower, but to reach the actual summit you must veer off the road to the left and follow the trail another few hundred yards to O’Leary Peak proper. Hikers of all abilities can conquer O’Leary. The trail can be arduous because of its length, uniformity (two track road), and loose gravel underfoot. However, by packing appropriately to endure weather and time required, then sticking with it to the top, this summit is well within reach. Bring your dogs along for company and motivation. Avid hikers looking to bag another Arizona summit should not miss an opportunity to check this one off. At 8,937 feet elevation, it is actually one of the taller ones around. From US-89, take the turn for Sunset Crater National Monument, but you won’t go all the way into the park so will not have to pay any fee. At 1.8 miles on this road, turn left onto FR 545A and continue for another ¼ mile to a paved parking area in front of a closed gate. This gate blocks the road to O’Leary’s fire tower, which is open only to the watchman. This road serves as the hiking trail until the very final summit push, which is on a singletrack spur trail. Expect intense sun and heat during the summer, but wind and cold the rest of the year on this exposed route. Plan accordingly.